Pop Quiz: You’ve got 60 seconds to figure out how to fix your cable box so you can watch the big debate. Here’s a hint… pound away! And I sat down in front of my Panasonic 42” Plasma TV as a proud citizen of the United States of America. That moment could well mean one of our recent political smack-downs was on the immediate horizon. Or “Dancing with the Stars” was on. But in fact, the Vice Presidential Debate was about to begin. Of course, my TV’s picture should have been perfect, as it was powered by Cablevision’s Optimum DVR box. As my TV’s glow grew brighter, and the image of Wolf Blitzer appeared, I noticed the typical text box at the bottom of CNN was partially cropped off. I looked closer at the entire picture, and all four edges were actually cropped off, as if the entire frame was zoomed in a bit. I didn’t want to watch the debate with half of Biden and Ryan’s faces cut off. I wanted a full-on view of the spectacle! So I immediately jumped into emergency diagnosis mode. I ran over to a small glass case mounted on the wall next to the TV, smashed in the glass with my elbow, and pulled out a small piece of paper with the code-red check-list. I quickly looked at a few other channels to make sure CNN wasn’t just fritzing out. They were all displaying in the same zoom mode. I checked the Blu-ray input on the TV. No problem there. So the cable box was clearly the culprit. I reviewed the cable box’s set-up menu. just in case. No luck. I stared at the last item on the list. Sometimes rebooting just does the trick. Then my wife walked in and sat down. She observed my poorly masked frantic state and asked what the problem was. The debate was about to begin. The proud home IT guy had to fess up that even though we were funding a small country’s operating budget with our monthly cable bill, I couldn’t get the cable box to behave. She let me off easy. “How bad could it be?” she said as she invited me to sit down. So we watched half the debate. We actually stuck it out for the full ninety minutes, but remember, we could only see half the picture. Since the split screen of the two candidates exaggerated the zoom problem, I felt we really didn’t get the complete experience. A few days after my humbling (hobbling?) tech glitch, I figured I’d better fix the problem. I figured I would likely have to replace my cable box. I wasn’t too excited about this, because there were still twenty unwatched shows on the DVR, which would be lost after a box switcheroo. I explained my problem to the friendly customer service representative. He then told me to go to pick up my cable remote and press the “#” button on the bottom right. Bingo. The TV’s image returned to normal size. I thought, “Why would anybody know about this button?! It’s not labeled at all! There’s already an official screen set-up section in the cable box’s menu! He was actually very nice, and I know he had nothing to do with the decision to create this disruptive remote control button. And there was a silver lining. I got to keep all my DVR recordings. But I was really cranky that this simple problem had derailed my election central viewing experience. I just couldn’t accept that it was my fault. The blame had to lie elsewhere. So I went online to see what education support Cablevision offered for their remotes. 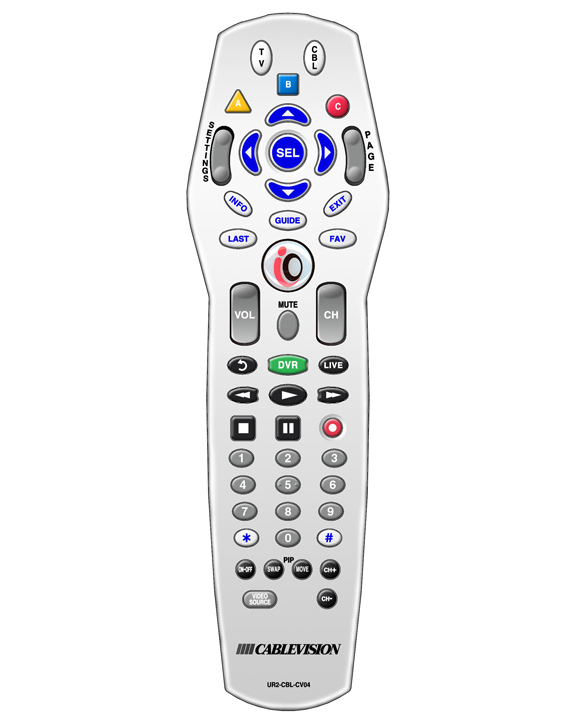 On Optimum’s website, there indeed is a section that displays my infamous DVR remote and each button’s functionality. So by the book, Cablevision is technically covered, and I’m the Luddite. I’m sure I’m not the only one who’s fallen into this trap. But we’re not quite done yet with my story… are we? Yes, I’ve left out one important detail. When I later explained to my wife that I had fixed the cable issue, she asked me how the problem began in the first place. Well, I knew it wasn’t my wife. She’s already joined much of today’s digital consuming population, finding most of her desired content on her laptop. The operation of our hulking and under-watched TV falls under my watchful eye. Well, then there’s my toddler. Coincidentally, he’s done some other tech damage of late. And he loves picking remotes up and pressing all the buttons. But this one has typically been placed out of his reach. I’ve decided it would be uncool to blame him. So that leaves only one person. Don’t press the “#” on your Cablevision DVR remote control. And keep it at least five feet off the ground. Now that I’ve got the whole picture back in focus on my TV, I’m wishing the political picture could be so simple. Fortunately, that’s a question for someone else’s blog. Are you sure you didn’t press the # button in order to cast a early vote for one of the candidates? LOL You know – that’s not a half-bad idea – that would be easier! – And mentioning that Dancing With The Stars might have been on at the same time – I’m sure you can remember back to when there was only 3 or 4 tv channels – and when the debates were on – that’s all you could watch back then! Voting via your cable remote? Hmmm… I think you may be on to something!